One of the biggest difficulties facing anyone trying to develop a screen/desktop sharing application for the iPhone is how to make the most of the limited screen space available. Wyse PocketCloud from Wyse Technology seems to have solved this problem with a flash of ingenuity, by creating an iPhone-based thin-client that optimizes screen space without significant sacrifices in usability. Thin, Not Limited: PocketCloud offers several features—including local text editing, and Touch Pointer—that greatly simplify working remotely using a very small screen. Wyse is no stranger to the world of thin clients, Window’s Terminal Services, and remote desktop protocol (RDP) connections; in fact, you’ll find the company’s hardware-based thin-clients in corporate setting everywhere. Like Citrix Receiver, PocketCloud lets you use your iPhone or iPod touch to connect to, work with, and support remote PCs. PocketCloud also lets you connect to any computer that supports an RDP connection; it will also let you work with the VMWare Views virtual desktop infrastructure. Setup on your iPhone is simple—as long as you have the proper connection information, it only takes a matter of seconds. As I said in my Citrix Receiver review, one of the biggest shortcomings to any iPhone app designed to connect to a desktop computer is that the screen is unreasonably small—so small that using your phone for work, unless it’s an emergency, is impractical at best. Two features in PocketCloud go a long way toward making real work on your iPhone a reasonable possibility. The first is a feature called Touch Pointer, which places a draggable pointer on the screen that lets you easily select, drag, click, double-click, and right-click items on the screen with a high degree of precision even if all the icons on the screen are incredibly small. Using this tool keeps you from having to continuously resize the screen in order to see, select, and open documents or choose menu items. PocketCloud has added a surprisingly simple solution for allowing you to work in word processing or perform any text entry on the remote computer. When the iPhone’s keyboard appears, you’ll also see a small triangle appear above the keyboard. Tapping this keyboard pulls up a text entry window on your iPhone where you can type your text, enjoy the benefits of the iPhone’s built-in text correction, and see all the text that you enter as you type it. Once you’ve finished editing, PocketCloud pastes your newly entered text wherever your cursor is on the remote computer. I found this to be orders of magnitude easier than typing and scrolling on the remote screen. 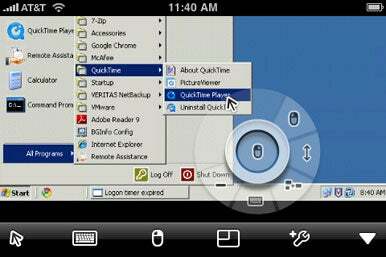 One additional feature that may appeal to some iPhone and iPod touch users is PocketCloud’s thin-browser feature. This feature requires the installation of the Wyse PocketCloud Companion on the remote computer, but once you’ve installed it, you can open a web browser within PocketCloud and access Web pages that require Flash, ActiveX, Silverlight, and Java. Of course, I’m not talking about accessing these features with any kind of blazing speed, because the browsing is taking place on the server side and is then streamed to your phone. But this is a useful tool if you need it in a pinch. Also, I found it difficult to select text in the browser’s address field when PocketCloud’s keyboard was on the screen. Wyse PocketCloud significantly ups the game for remote computer access from your iPhone, adding features that make remote access a real feasible option for the iPhone road warrior.